In the past we’ve noted the similarities between the anti-smoking policies of Hitler and the Nazis and today’s anti-smoking zealots. Now we read reports that another of America’s mortal enemies, the Taliban that supported Osama Bin Laden’s terrorist attacks, is also a distinctly fascist when it comes to smoking. 18. Mujahideen should refrain from smoking cigarettes. 25. Anyone who works as a teacher for the current puppet regime must receive a warning. If he nevertheless refuses to give up his job, he must be beaten. If the teacher still continues to instruct contrary to the principles of Islam, the district commander or a group leader must kill him. Just so we’re clear: Killing a teacher – mandatory (after warning and beating). Smoking cigarettes – absolutely forbidden! Now obviously we know that the smoke-hating terrorists are maniacal (that’s why they’re terrorists), but their anti-tobacco policy does raise one question: If terrorists want to ban smoking, does that mean that when we ban smoking the terrorists win? 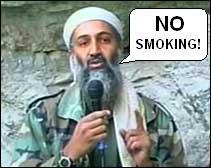 I knew the anti-smoking zealots were in bed with the Taliban! "18. Mujahideen should refrain from smoking cigarettes." Yeah, but what about cigars?!? Obviously if the Nazis or Taliban do something it is the worst idea ever, scan for sarcasm here.